Two Ellon councillors have spoken out on eyesores across the town. 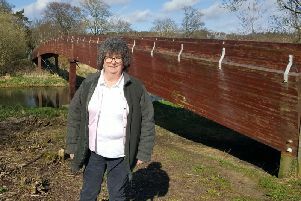 Cllr Gillian Owen said: “The Ythan Centre which has lain empty for the last couple of years needs to look kempt and cared for and this, right in the centre of town, makes matters worse. I have asked officers to see if they can get rid of the weeds. “The stairs coming down from the Castleton development are again in a shoddy state. This is a vital link with the town for those residents and it is important that they are accessible and those using them are not fighting the long grass and huge weeds, and the green which was opposite the entrance to the old Academy is totally overgrown. Meanwhile Cllr Anouk Kloppert has urged residents to clean up their litter after a photo posted on Facebook showed rubbish strewn across woodland behind the former Ellon Academy site. She said: “Best thing is just to clear it away and take it home to protect other people and wildlife in the woods.